Background and aims: Clarification of the position of the European Society of Gastrointestinal Endoscopy (ESGE) regarding the interventional options available for treating patients with chronic pancreatitis. Methods: Systematic literature search to answer explicit key questions with levels of evidence serving to determine recommendation grades. 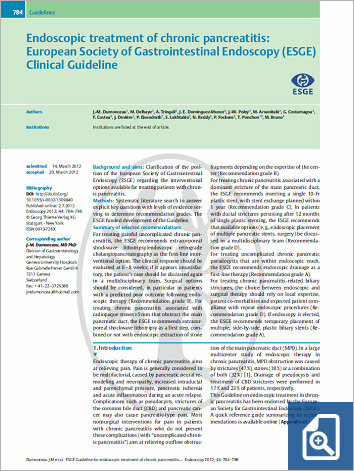 The ESGE funded development of the Guideline. For treating painful uncomplicated chronic pancreatitis, the ESGE recommends extracorporeal shockwave lithotripsy/endoscopic retrograde cholangiopancreatography as the first-line interventional option. The clinical response should be evaluated at 6–8 weeks; if it appears unsatisfactory, the patient’s case should be discussed again in a multidisciplinary team. Surgical options should be considered, in particular in patients with a predicted poor outcome following endoscopic therapy (Recommendation grade B). For treating chronic pancreatitis associated with radiopaque stones≥5mm that obstruct the main pancreatic duct, the ESGE recommends extracorporeal shockwave lithotripsy as a first step, combined or not with endoscopic extraction of stone fragments depending on the expertise of the center (Recommendation grade B). For treating chronic pancreatitis associated with a dominant stricture of the main pancreatic duct, the ESGE recommends inserting a single 10-Fr plastic stent, with stent exchange planned within 1 year (Recommendation grade C). In patients with ductal strictures persisting after 12 months of single plastic stenting, the ESGE recommends that available options (e. g., endoscopic placement of multiple pancreatic stents, surgery) be discussed in a multidisciplinary team (Recommendation grade D). For treating uncomplicated chronic pancreatic pseudocysts that are within endoscopic reach, the ESGE recommends endoscopic drainage as a first-line therapy (Recommendation grade A). For treating chronic pancreatitis-related biliary strictures, the choice between endoscopic and surgical therapy should rely on local expertise, patient co-morbidities and expected patient compliance with repeat endoscopic procedures (Recommendation grade D). If endoscopy is elected, the ESGE recommends temporary placement of multiple, side-by-side, plastic biliary stents (Recommendation grade A).